网站访问者常见问题回答！ - 诗歌新闻/广告版 - 《诗歌报》论坛 - Powered by Discuz! The Shigebao website has a large but loose management team. From updating content and gathering news to setting up poets’ pages and compiling the webzine and journal, we rely on cooperative efforts by our editors and page-masters in various places. With the large number of registered members on our forums, there is a thriving exchange of ideas; we have an impressive scholarly atmosphere, with many topics for discussion. Our site has influenced and given impetus to quite a few new writers. We open-heartedly help other internet poets set up sites and forums of their own, working together with them so that exchanges of poetry can thrive. Shigebao leads the way toward positive interchange: we oppose tedious personal attacks and invective. We allow the co-existence of poetic expression in many forms. We are open to pluralistic attempts in writing, and we preserve the non-partisan spirit of literature. We give exposure to new faces, not only to poets with established reputations. The Shigebao website has brainstormed and administered many important activities and events in the field of internet poetry. We have also kept up good ties with mainstream poetry media and self-published poetry journals. We often recommend the best works by internet poets for publication in print journals. Shigebao is systematizing its content and establishing its own unique character. Henceforth, Shigebao will adopt a more focused attitude, to document and promote the development of internet poetry. 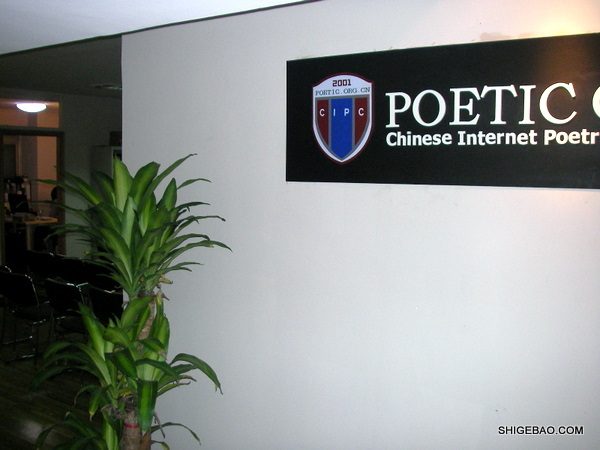 Our objective: To be the best Chinese-language poetry website; to bear witness to the development of internet poetry; to pave the way for internet poetry’s advancement.